The observant amongst you may have noticed a new badge appear at the top of the sidebar a few weeks ago and you may have even been curious enough to click on it... but if you haven't or if you didn't, I'm here now to tell you all about it. 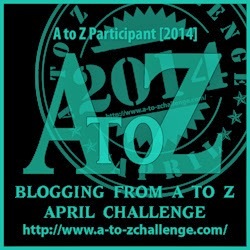 I've lost my mind, er, I mean I'm going to attempt to blog my way from A to Z throughout April as part of the official 2014 Blogging from A to Z April Challenge. Essentially this means one post per day throughout April, with each post designated by the corresponding letter of the alphabet with Sundays off for good behaviour, sleep. Lots of bloggers are taking part and everyone, participants and supporters alike, are encouraged to go browse the official list and comment on the posts. In order to keep things sane, the advice I've received is to keep posts relatively short! So in April there will be no War and Peace rambling posts but fear not, all the posts will be my usual fare of Trollbeads and Jewellery and associated things you'd normally expect to find on Curling Stones for Lego People. I'd love for you to join me in my journey, so whether as one of my blogging friends you join in the challenge yourself, or as a regular or new visitor you pop in during April to give me some support, you can sign up to receive posts direct by email, follow via Bloglovin', bookmark the page to check in directly or come back once it's safe and browse the A to Z in one go! However you do it - I'd love to see you here! Still I have a week to come up with A right?? When I saw this first mentioned in your twitter feed a few weeks back I briefly considered challenging myself as well, but I know I'd end up writing something at 11pm at least once during the month! I'm sure I'll end up writing something at 11pm, and I'm pretty sure it will be more than once too! I did have a "what have I done" moment a few days ago but tally ho and all that! I'm going to try and have the posts up by 8.30am GMT so that my feedburner catches them and puts them out early that day... that's the plan but whether they will all make the deadline I don't know! Hello! I'm new to your blog (popped in via endangered Trolls) and want to offer my support! I think you're in the UK too so will be def cheering you on thru this challenge. Will be interesting to see what you come up with. Thanks for taking the time to add your comment and your support, I really appreciate it.